Off the coast of Tahiti, the island of Moorea rises like a vision across emerald waters. The surf crashes on Pitcairn Island’s St. Paul Rocks. Hike on Henderson, a block of coral limestone raised 50 feet above the sea. Zodiac landing on the uninhabited atoll of Tenararo. View of Pitacairn from the sea. View from the heights of Pitcairn island. Swimming with the Manta Rays off Hiva Oa. South Pacific Easter Island birdman cult ancient rock carving. Tahiti. Hiva Oa. Mangareva. Pitcairn. Rapa Nui. These are names that conjure up all the adventure and romance of the South Seas. Scattered across 3000 miles of ocean, these islands have long been a refuge for dreamers and outcasts, the daring and the desperate. To set foot on these storied isles is the cherished ambition of many a traveler. In 2015 I was lucky enough to travel with Seattle’s Zegrahm Expeditions to visit them all, and more, in an epic voyage across the true South Pacific. Tahiti. To the 19th century romantics, Tahiti was an earthly paradise, home to beautiful innocents untainted by the industrial civilization then scarring the face of Europe and America. 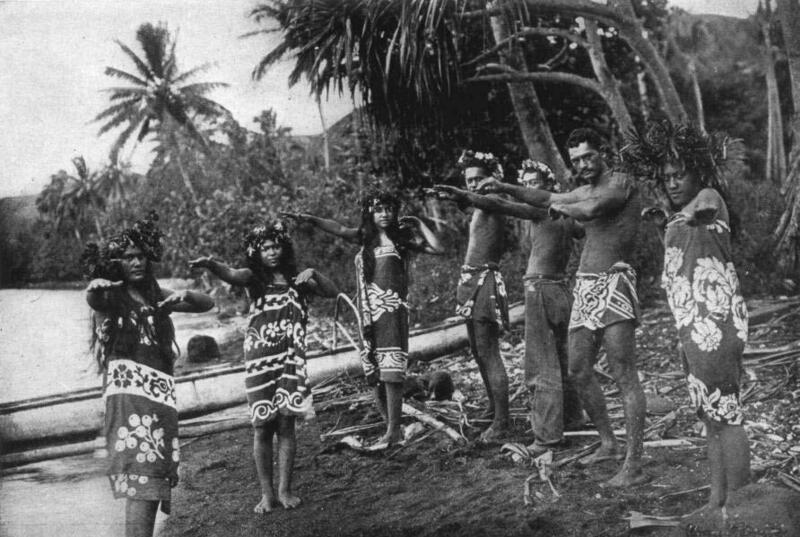 Hiva Oa dancers dressed in sarongs, or pāreu, around 1909. The island was celebrated by writers and artists including Herman Melville, Paul Gauguin, and Robert Louis Stevenson, who created an image of tropical splendor that has never faded. First, the good news — 21st century Tahiti is still incredibly beautiful, with waterfall-laced mountains and breathtaking beaches. It has also been thoroughly discovered. In 2015, more than 180,000 tourists visited, and the coastline is crowded with resorts. It is a dream island no more. But, as a relaxing place to spend a day waiting for the arrival of our expedition cruise ship, it couldn’t be beat. I sipped cool drinks (yes, they may have contained umbrellas) on the resort beach and contemplated the nearby island of Moorea rising like a vision across the emerald waters of the lagoon. 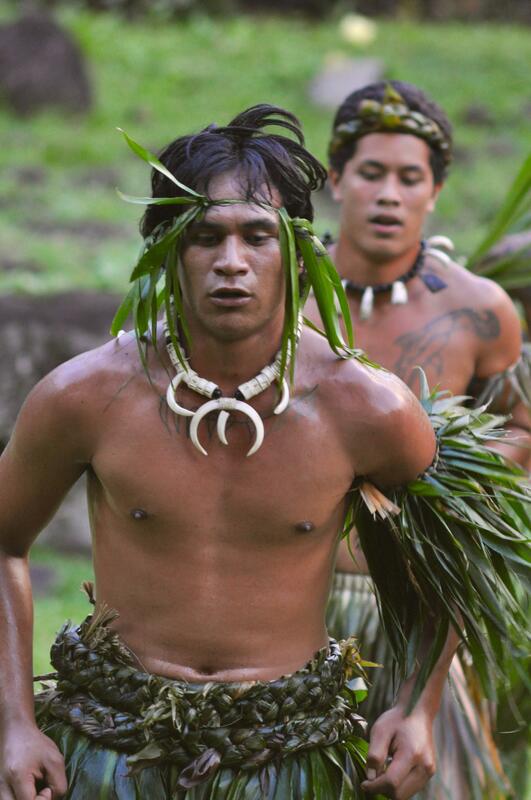 On the island of Nuku Hiva, traditional dancers offer up their fierce, earth-shaking performance for visitors. Exotic birds hopped around — all, unfortunately, introductions from other parts of the world. On Tahiti, as on all inhabited islands in the Pacific, native birds and other wildlife are in desperate straits due to introduced predators, competitors, and diseases, and to the loss of their natural habitats. A major goal of this trip was to reach uninhabited islands where we could still experience the glory of the wild South Pacific. Our 100-passenger ship, the Caledonian Sky, was equipped with nimble zodiacs that would allow us to land on even the most remote atolls — provided the tides and the ocean swells cooperated. We would also be able to pull on masks and snorkels and explore the coral reefs for which the South Pacific is famous. I could hardly wait… but in the meantime, maybe another drink? The Marquesas. The next day, the Caledonian Sky arrived from its passage across the central Pacific, having set out from Fiji. Soon, we were aboard, and the lofty peaks of Tahiti were disappearing below the ocean horizon as we steamed north toward the Marquesas. 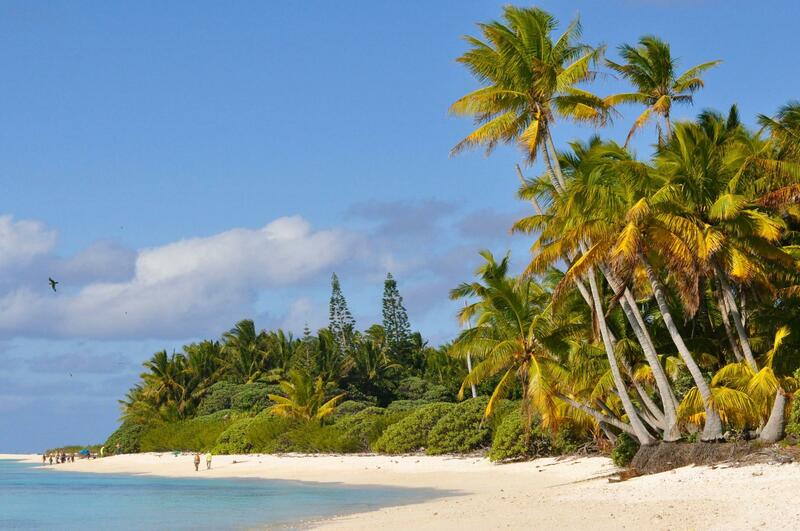 This archipelago is one of the most remote in the world, 850 miles northeast of Tahiti. The large central island of the group, Hiva Oa, is where the painter Paul Gauguin retreated in 1901 after deciding that Tahiti was becoming too civilized. 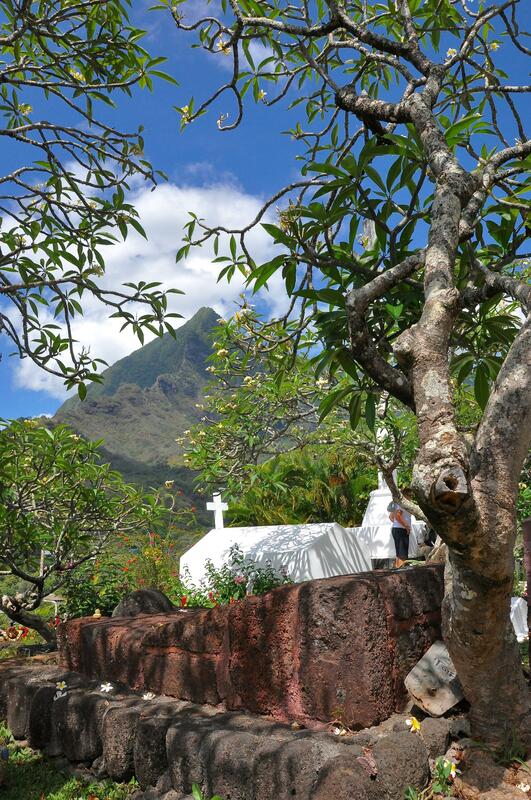 On the island of Hiva Oa, Paul Gauguin’s grave. Even today, these islands match our dreams of the unspoiled South Pacific: green mountains rising from the deep blue sea, scattered villages tucked behind coconut palms in hidden coves, friendly people -- and frightening carved tiki attesting to a warlike past. The islands are home to less than 10,000 people, and most tourists arrive in their own sailboats. 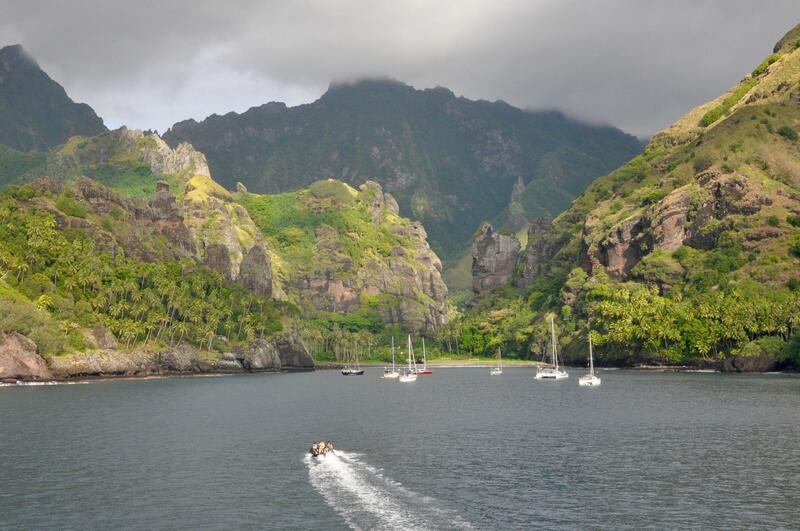 We saw no other visitors on our stops at the three largest islands, Nuku Hiva, Hiva Oa, and Fatu Hiva. Each is as beautiful and exotic as its name, and each offered an unforgettable memory. At our first landfall, Nuku Hiva, we were treated to a display of traditional dance on a traditional ground ringed with tiki. This fierce, earth-shaking performance bore no resemblance to the “Polynesian dance revues” of Hawaiian hotels, and left all of us grateful that peace has come to the Marquesas. The central island of Hiva Oa featured a visit to Paul Gauguin’s grave, constructed of appropriately rough-hewn chunks of lava rock, standing in marked contrast to the prim whitewashed graves of the other Europeans in the small cemetery. But the most indelible memory of Hiva Oa occurred offshore, when we all had the opportunity to snorkel with a large gathering of manta rays. These great graceful underwater fliers, with “wingspans” of six feet, glided among us, feeding on a plankton upwelling and often coming close enough to touch (which, of course, we refrained from doing). At the southern island of Fatu Hiva, we anchored in the Bay of Virgins, often ranked by yachtsmen as the most beautiful in the world — and who am I to argue with yachtsmen? The Bay of Virgins on the island of Fatu Hiva, often ranked by yachtsmen as the most beautiful in the world. While most of our party explored the village of Hana Vave, a small group of birders climbed into a zodiac and headed south for the next valley along the coast. There, one of the world’s rarest birds clings to survival. 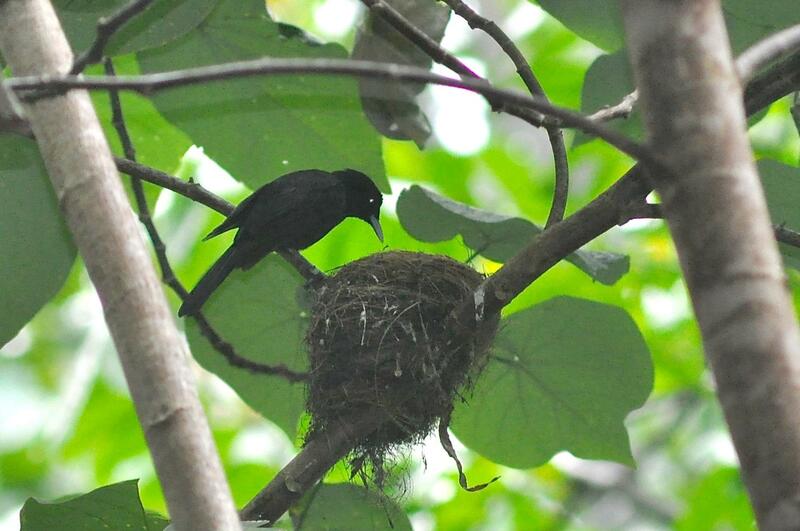 The Fatu Hiva Monarch is believed to number less than 25 adults, with five or fewer breeding pairs. They are threatened by introduced cats and rats, and survive only through the nest-protection efforts of the Société d’Ornithologie de Polynésie and the local community. These dedicated volunteers led us up a steep, slippery streambed to the last active nest of the season, where we all had wonderful but heartbreaking looks at the bird feeding its young, truly among the very last of their kind. The Tuamotus. From the Marquesas we sailed south into the archipelago of coral atolls called the Tuamotus, the well-named “Distant Islands”. These 80 or so islands are scattered like a broken string of pearls over a huge area almost equal in size to Western Europe. Here we made four landfalls: at the inhabited atolls of Rangiroa, Puka Puka, and Puka Rua, and uninhabited Tenararo. Although we were greeted with lavish hospitality at each of the inhabited islands (roasted breadfruit and octopus, anyone? ), I was itching for a chance to finally see what an uninhabited and rat-free atoll was like, and so was sure to be on the first zodiac making the wild ride through the surf and over the fringing reef of Tenararo. It is important to specify both “uninhabited” and “rat-free” because Polynesian rats have reached almost every speck of land in the Pacific. Even if there is no permanent human settlement, these rats can devastate the indigenous landbirds and nesting seabirds, often driving them to extinction. Somehow the tiny atoll of Tenararo has escaped infestation by rats, and it now harbors the largest surviving populations of two landbirds found nowhere else but the Tuamotus: the Polynesian Ground Dove and the Tuamotu Sandpiper. To my delight, as soon as I jumped out of the zodiac onto the coral rubble beach, I was surrounded by Tuamotu Sandpipers. 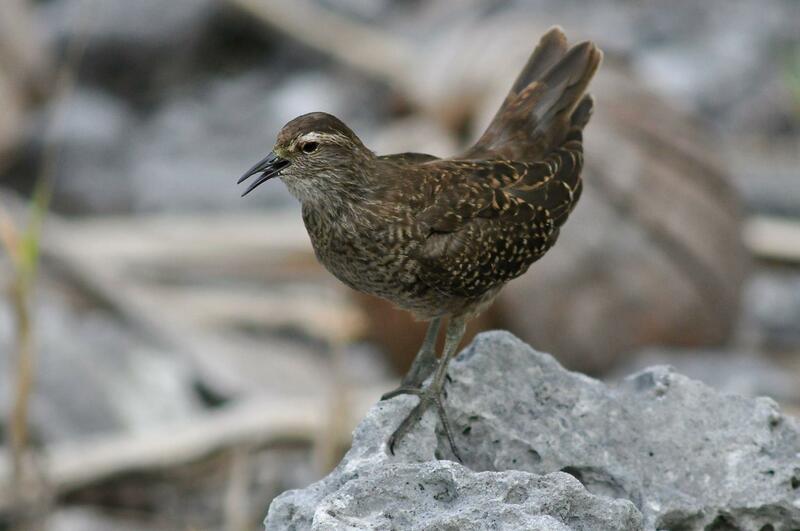 These unique birds are the only sandpipers that nest on coral atolls. Unlike typical sandpipers that probe in mud or sand for their food, Tuamotu Sandpipers have amazingly evolved to feed on … nectar! They have sharp beaks designed to reach into the nectar-rich flowers of a shrub called Scaevola, and obtain much of their energy from this source. Like most birds on predator-free islands, the sandpipers were remarkably tame, and calmly walked around our feet as they fed at the flowers, only interrupting their feeding to engage in pugnacious flight displays and chases. It was a joy to see these birds, so perfectly adapted to the challenges of their coral atoll habitat, still living their lives on one of the most untouched islands on Earth. Mangareva. South of the Tuamotus lies Mangareva, the largest of the Gambier Islands, the southernmost archipelago of French Polynesia. Although administratively considered part of the Tuamotus, these are volcanic “high islands” very different from the low atolls we had been sailing among. Today, Mangareva is a sleepy outpost most famous for its Roman Catholic cathedral richly decorated with lustrous pearl oyster shells. However, a thousand years ago it was a great Polynesian trading center, and dispatched voyagers to establish settlements at least as far east as Pitcairn Island. This golden age came to an end due to overpopulation and deforestation, and the power of the Mangareva kings had collapsed long before the arrival of the first Europeans in 1797. The Pitcairn Islands. Before undertaking this voyage, I had always thought of Pitcairn as a single, singularly isolated island. Imagine my surprise when I discovered that there are four islands in the Pitcairn group: Pitcairn itself (the only “high island”), the atolls of Oeno and Ducie, and the raised “makatea” island of Henderson (more about that in a minute). Oeno beach, perfect for a picnic. Once a year, they leave their incredibly isolated island for an even more isolated one, where they camp out for a week to get away from the hustle and bustle of life on Pitcairn. Both Oeno and Ducie are uninhabited, and thanks to successful rat eradication efforts carried out in 1997, they are home to thriving, raucous colonies of seabirds. We had to step carefully to avoid the nests of Brown Noddies, Masked Boobies, Murphy’s Petrels, and Christmas Shearwaters, while immaculate White Terns, those most angelic birds, hovered over our heads, observing us with their huge dark eyes. Meanwhile, the snorkelers were gliding above the reefs, delighting in schools of colorful wrasses, damselfish and butterflyfish, electric-blue starfish, and corals of every kind. At Ducie, the divers were thrilled at the sight of an aggregation of gray reef sharks — the only place on the voyage where we saw these magnificent and increasingly endangered predators. Henderson is entirely different. A block of coral limestone raised 50 feet above the sea, it has only a few narrow beaches, no lagoon, and only a single brackish fresh-water spring. The top of the island — flat as a pancake — is covered in impenetrable scrub forest growing up out of jagged fossil coral rubble. This may not sound like your idea of a South Seas paradise, but for biologists it is truly extraordinary — one of only two raised atolls in the world whose ecosystems remain relatively intact (the other is Aldabra in the Indian Ocean). Note that I said “relatively” intact. Although Henderson, with its limited fresh water, was never home to large permanent human settlements, it was often visited by Polynesians, who exterminated at least three endemic pigeon species before the island was discovered by Europeans. These early visitors also brought Polynesian rats. Despite a herculean rat eradication effort in 2011 which killed 99.9% of the rats on the island, an estimated 50-100 managed to survive. So fecund are rats that these survivors have now fully repopulated the island. Still, Henderson is home to healthy populations of four endemic landbirds, including the charming Henderson Lorikeet, a colorful little parrot, and the Henderson Rail, a flightless jet-black bird that stalks through the tangled forest on bright red legs. 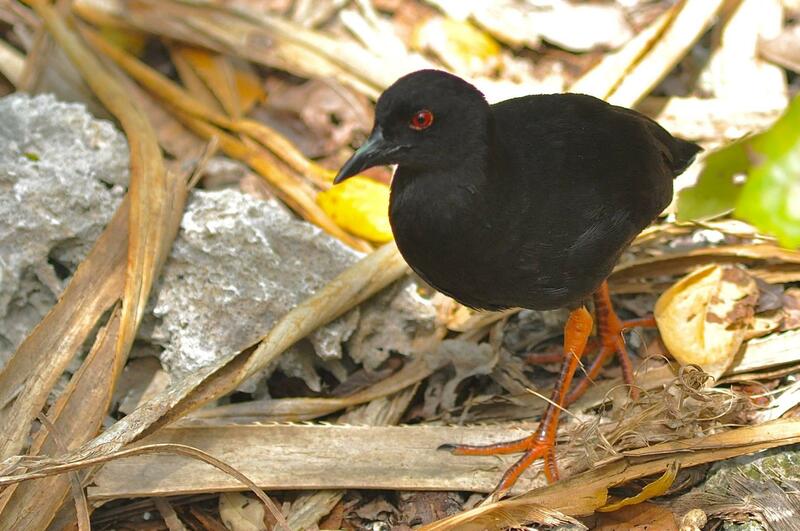 The Henderson Rail, a flightless jet-black bird that stalks through the tangled forest on bright red legs. Of course, everyone was eager to set foot on Pitcairn itself. Famously chosen by the mutineers on the HMS Bounty as the island where they were least likely to be discovered by the Royal Navy, Pitcairn is remote as they come. Less than 2 square miles in size, Pitcairn is a speck of land more than 3000 miles from both New Zealand to the west and Chile to the east. It lacks an airstrip and any protected harbor. The grandly named “Bounty Bay” is a small cove where heavy swells often make landings impossible. Thanks to a bit of luck with the ocean conditions and the amazing skill of our zodiac drivers, we were able to get everyone ashore — and then we all immediately began to worry that we might not be able to get off again. Scenically, Pitcairn is quite lovely, a steep island with fertile red soil and green hills rising from the dark sea. Today, it is home to only about 50 residents, and there is concern that in a generation or two there may be no one left, as the young people increasingly go to New Zealand and do not return. But on our visit, we were greeted warmly, proudly shown the HMS Bounty anchor and the small museum, and given the opportunity — which we happily took — to buy Pitcairn t-shirts, hats, carvings, and stamps. A group of us climbed to the top of the island and looked out over Pacific, which seemed to begin right at our feet and stretched in every direction to the curved horizon. It was not hard to imagine the immense weight of isolation that the mutineers must have felt after they burned their ship and gazed over that endless sea. Rapa Nui (Easter Island). I’ve traveled the world around, and I have never been anywhere so full of mystery, or so full of portents, as Easter Island. 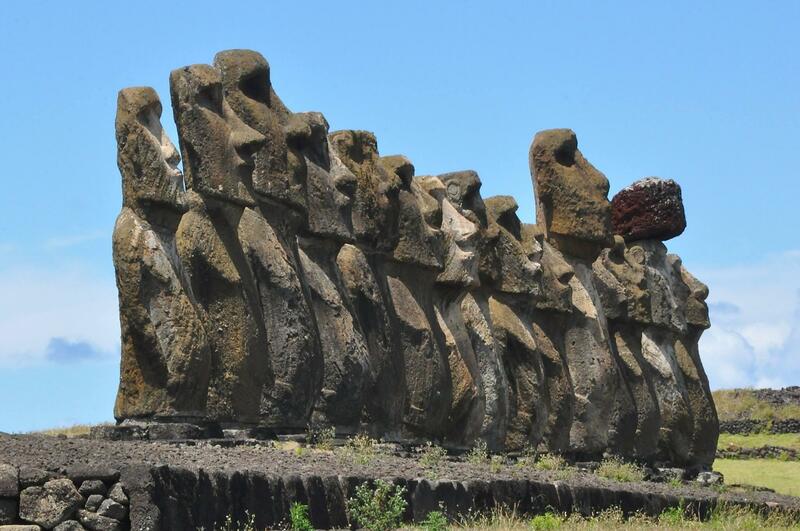 Standing in the presence of the great carved stone faces, the moai, I felt watched, I felt judged, and I felt warned. Easter Islanders carved almost 900 great stone moai, vastly enlarged and stylized versions of the tiki statues that are common on the Marquesas, Hawaii and elsewhere in Polynesia. It is hard indeed to contemplate the fate of Rapa Nui without a shiver, the kind of superstitious shiver said to mean someone has stepped on your grave. The bare bones of Rapa Nui history are fairly well known. The island was settled by Polynesian voyagers from Mangareva (1600 miles away) or the Marquesas (2000 miles away) sometime around 1000 AD, give or take a century or two. They arrived on a subtropical island covered with a forest of the largest palm trees in the world, home to at least 5 species of land birds and great colonies of seabirds. Having reached such an incredibly isolated and tiny landfall (the island is about 63 square miles), the voyagers apparently never left again — there is no evidence of contact between the people of Rapa Nui and any other humans until the Dutch explorer Jacob Roggeveen stumbled upon the island on Easter Sunday, 1722. It would be entirely understandable if, as is often stated, the inhabitants of Rapa Nui came to believe that they were the only people on Earth. Isolated though they were, the islanders established one of the world’s most distinctive and creative cultures. Over the course of 500 years — apparently beginning soon after their arrival — the Easter Islanders carved almost 900 great stone moai, vastly enlarged and stylized versions of the tiki statues that are common on the Marquesas, Hawaii and elsewhere in Polynesia. About a quarter of these were somehow transported from the great quarry at Rano Raraku and stood upright on platforms, or ahu. 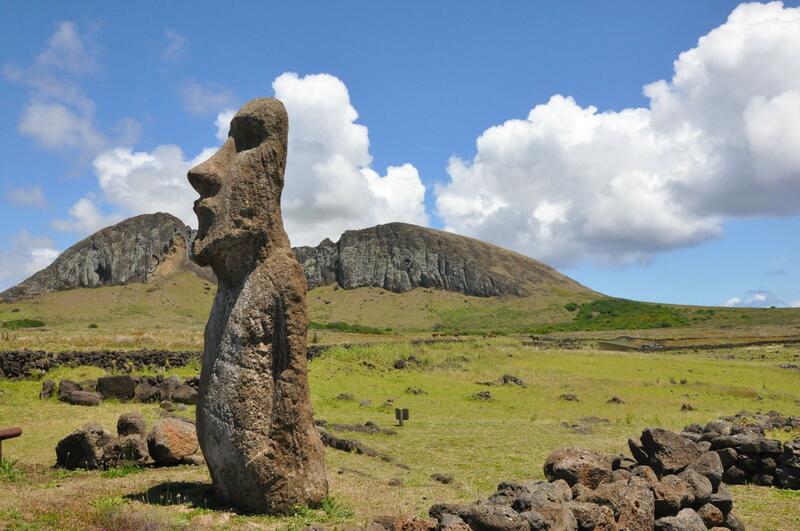 The largest such moai, named “Paro,” is over 30 feet and weighs over 80 tons. The people of Rapa Nui did not have metal tools, the wheel, or any draft animals. The logistics of transporting and erected the moai boggles the mind, and many theories have been advanced over the years. Whether rollers or skids were used (the two leading theories), it is obvious that many, many logs were involved. Ecological evidence indicates that the island’s deforestation (due to clearing for agriculture and the activity of rats, as well as to the demands for logs) lead to a decrease in rainfall on the island, to erosion, and to widespread famine. Ahu Tongariki is the largest ahu on Easter Island. Nevertheless, moai carving continued, and there is evidence of a strictly hierarchical society in which a large proportion of the population was employed in the creation and deployment of the statues. By 1650, the deforestation of Rapa Nui was complete, as shown by the disappearance of the pollen of the giant palms from the island’s sediments. Along with the negative environmental effects on land, this meant that the people of Easter Island were truly trapped: they no longer had the possibility of building ocean-going canoes for fishing or voyaging. Less than a hundred years later, the first European ship arrived, and there is evidence that its brief visit was enough to bring deadly diseases to Easter Island. When Captain Cook visited in 1774, he recorded that many moai had been toppled, indicating a revolt against the formerly all-powerful chiefs who had failed to prevent ecological disaster and terrible epidemics. About that time, a new cultural obsession took hold to replace moai building: the Bird Man Cult. This held that instead of speaking through a hereditary elite, the gods communicated through Bird Men, who were selected in an annual competition to recover the year’s first Sooty Tern egg from the tiny islet of Motu Nui, over a half-mile offshore. After a period of isolation and spiritual preparation, the contestants had to scramble down an 800 foot cliff to the sea, swim to the island, clamber up its wave-washed rocks, recover a tern egg, swim back, climb up the cliff — and deliver it unbroken. At least, so goes the story. I have a hard time believing it in all details, but it seems unquestionable that swimming to the island for the egg was certainly the focus of the competition. The story of Easter Island is told as a dramatic and persuasive cautionary tale by the biologist Jared Diamond in his book Collapse. It is hard to avoid seeing parallels between isolated, finite Easter Island and isolated, finite Planet Earth, both inhabited by heedlessly rapacious humans. Perhaps Diamond makes an oversimplified case — certainly that was the opinion of our excellent shipboard archaeologist, Annette Kuhlem, who has conducted much fieldwork on Easter Island. But her argument — that the fate of Rapa Nui was not as dramatic or singular as Diamond claimed — seemed to me even more foreboding. Annette believes that the decline of Easter Island was not due to ecological destruction fueled by religious obsession, but rather to the predictable effects of overpopulation and tribal competition, phenomena observed in many other places in Polynesia. It was Easter Island’s absolute isolation that made these processes more extreme. She is probably right — but that gives little comfort. Almost all the moai on Rapa Nui stand on the coastline, with their backs turned to the sea, that incomprehensible immensity, gazing inland, inward. They tower over us, and look past us, forever, at … what? Standing before those stone faces that seem to know so much, but will never speak, I felt I had truly reached the end of the world. The imagination could travel no farther from the warm embrace of Tahiti. The next day, I boarded an airplane and returned to the busy world of everyday. But the wind-swept silence of Easter Island, laden with premonitions, is something I will carry now, always. Pepper Trail is a naturalist and writer in Ashland, Oregon. Researchers at Oregon State University have discovered a sound coming from one of the deepest spots in the ocean. 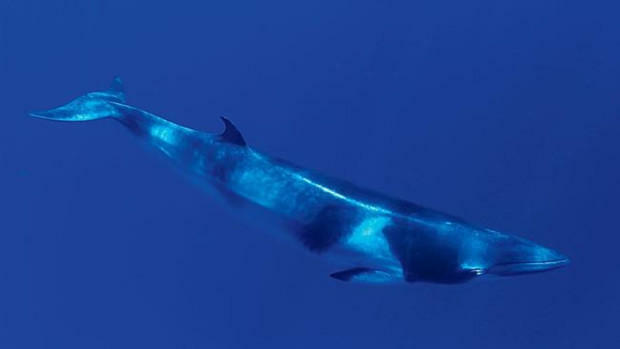 They believe it’s the song of a Minke whale, but it’s not like any they’ve identified before. The so-called “Western Pacific Biotwang” is more horror movie than Nashville ballad. A low moan at the beginning is typical of baleen whales, but it was the end that caught the ear of OSU researcher Sharon Nieukirk. “What makes this call special is the second part, and the way it sweeps way up and it sort of has that metallic twang sound to it,” she said. Candace Gossen talks about digging into Easter Island. Easter Island is a fascinating place, and not just because of the the moai, the statues with the big heads. If you look beyond the statues in photographs, you see a grassy landscape. As far as scientists can tell, the island was a place with lots of trees when humans arrived. There's still some debate about what happened there, and Dr. Candace Gossen of Blackcoyote Archaeology is one of the scientists trying to find answers.